Writing involves risks--the risk that one will be misunderstood, the risk of being persecuted, the risks of being made a champion for causes in which one does not believe, this risk of inadvertently supporting a reader's prejudices, to name a few. In trying to give expression to what is true, the writer must "clear a passage within the agitated world of passions," an undertaking that always to some extent fails: writers are never the master of their own speech. 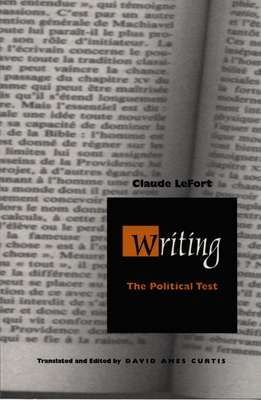 In Writing: The Political Test, France's leading political philosopher, Claude Lefort, illuminates the process by which writers negotiate difficult path to free themselves from the ideological and contextual traps that would doom their attempts to articulate a new vision. Lefort examines writers whose works provide special insights into this problem of risk, both literary artists and political philosophers. Among them are Salman Rushdie, Sade, Tocqueville, m Machiavelli, Leo Strauss, Orwell, Kant, Robespierre, Guizot, and Pierre Clastres. In Tocqueville, for example, Lefort finds that the author's improvisatory and open-ended expression represents the character of the democratic experience. Orwell's work on totalitarianism shows up the totalitarian subject's complicity in this political regime. And Rushdie is remarkable for his solid attack on relativism. With the character and fate of the political forms of modernity, democracy, and totalitarianism a central theme, Lefort concludes with some reflections on the collapse of the Soviet Union. This intriguing and accessible exploration of literature's political aspects and political philosophy's literary ones will be welcomed by those who have been stymied by current efforts to bridge these two fields. Taken together, the essays in this volume also stand as an intellectual autobiography of Lefort, making it an excellent introduction to his work for less experience students of political theory or philosophy.